↑ Nitecki, Matthew H. and Nitecki, Doris V. (1994). 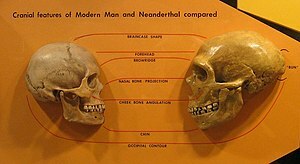 Origins of Anatomically Modern Humans. Springer. ↑ This is a matter of convention (rather than a factual dispute), and there is no universal consensus on terminology. 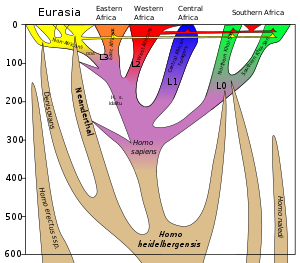 Some scholars include humans of up to 600,000 years ago under the same species. See Handbook of Death and Dying, Volume 1. Clifton D. Bryant. 2003. p. 811. See also: Masters of the Planet: The Search for Our Human Origins. Ian Tattersall. Page 82 (cf. Unfortunately this consensus in principle hardly clarifies matters much in practice. For there is no agreement on what the 'qualities of a man' actually are," [...]). ↑ It is important to note that this is a question of conventional terminology, not one of a factual disagreement. Pääbo (2014) frames this as a debate that is unresolvable in principle, "since there is no definition of species perfectly describing the case." ↑ based on Schlebusch et al., "Southern African ancient genomes estimate modern human divergence to 350,000 to 260,000 years ago" Science, 28 Sep 2017, DOI: 10.1126/science.aao6266, Fig. 3 (H. sapiens divergence times) and Stringer, C. (২০১২)। "What makes a modern human"। Nature। 485 (7396): 33–35। doi:10.1038/485033a। PMID 22552077। বিবকোড:2012Natur.485...33S। উদ্ধৃতি টেমপ্লেট ইংরেজি প্যারামিটার ব্যবহার করেছে (link) (archaic admixture).